Q. Who needs Safety Footwear? Q. What is a Safety shoe & how does it keep your footsafe? Q. How long should my Safety shoes last? Q. What kind of guarantee does your Safety Footwear carry? Q. What are the two major types of work-related foot injuries? Q. Can an employer pay an employee an allowance to cover the cost of Safety Footwear instead of actually providing the footwear? Q. What about casual or temporary employees, or those who stay for only a short time? Q: What are the various elements of a boot sole? Q: What is the strongest outsole construction? Q: What is the most comfortable sole construction? Q: What types of materials are used in midsole construction? Q: What are the materials used in insole construction? Q: What is the shank? Q. What makes Shoes most slip-resistant? Q. Why are some soles more slip-resistant than others? Q. Are all 'Safety Shoes' slip-resistant? Q. Does 'oil-resistant' mean the same as slip-resistant? Q. How long will the sole last? Q. How does Safetix ensure quality in its Manufacturing Process? Q. Does Safetix Safety Footwear meet the specifications of the Indian & European standard? Q. What benefit will my organisation derive if we change to Safetix Safety Footwear? Q: Are your composite toe footwear styles tested to the same impact & compression standards as your steel toe footwear styles? Q: Steel Toe vs. Composite Toe. Q. What do you offer in a men's traditional dress shoe style that is also steel toe? Q: What styles do you have that offer metatarsal protection? Q: What are some protective toe water repellant upper options you suggest? Q: What is S1-S5 classification for Safety Footwear ? Q: What is ESD ? Q.Electrical Hazard or Electro Static Dissipating...Which do I need? A. Most organizations understand that the first step in workplace safety is to remove potential hazards. However, since it is not possible to remove all hazards, personal protective equipment (PPE) may be required to help reduce injuries sustained in the workplace.Where a worksite has significant hazards that could result in injury to an employee's feet, the employer must provide suitable safety footwear at no cost to the employee. The Health & Safety in employment aims to promote the health & safety of everyone at work & of other people in or around places of work. To achieve this, it requires people who are responsible for work & those who do the work to take the steps to ensure their own health & safety & that of others. A. The basic feature of a safety shoe is a shoe that has a Steel Toe Cap. This is to provide impact protection for the toe area. An all leather upper can help keep your foot safe from hazardous chemical spills & an oil & acid resistant sole protects your feet when walking on a variety of different workplace surfaces. A polyurethane sole with a steel mid sole can give you slip resistance & penetration protection thereby keeping your foot safe. A. Generally, the manufacturers will say that the average life span of a pair of safety shoes is a year, depending on your work environment & personal wear & tear. If you polish your safety shoes & look after them, they will look after you. A. We offer a 6 month warrantee if you encounter a manufacturing problem. A. PHYSICAL: crushing, punctures, sprains, lacerations & thermal. This may happen as a result of slips, trips & falls. CHEMICAL: Due to use of Acid Alkali & chemicals resulting in burns & dermatitis. ELECTRICAL: Static & High Voltage. Where there are hazards on the worksite that are likely to result in these types of injury, then protective footwear must be worn. A. No. An employer cannot pay an allowance in lieu of providing necessary safety footwear, as employer has to ensure that worker to minimize the hazard should wear the footwear offering adequate protection. Nor can the employer require an employee to provide his or her own safety footwear as pre-condition of employment or as a condition of an employment agreement. A. Ownership of the footwear remains with the employer. The employer can require the employee to return the boots issued to them on termination of employment. A: The outsole is the bottom of the footwear & comes in direct contact with the ground; it provides a measure of protection, depending upon the material it is constructed out of, & is made out of a variety of materials (normally, PU, Rubber & TPU) with different tread designs. The midsole is the middle layer or layers that go on top of the outside; it helps provide durability & comfort to the boot. The insole is the comfort layer that goes on top of the midsole & on which in-sock is placed on which wearer's foot rests. A: Direct attach is the best – where the sole is injected into the leather upper in a liquid state &molded onto the boot. Here (Rubber/PU) is directly bonded with leather fiber for a waterproof strong bonding. In Direct attach no adhesive is used as sole material itself bears adhesive properties. The other construction are cemented – where the outsole is bonded to the leather upper with an adhesive & Goodyear Welted – where the outsole is sewn on to the leather upper & the boot can be resoled. A: Direct Attach is the most comfortable type of outsole construction, Cement is the next, and while Goodyear Welt construction is the least comfortable. A: The types of materials used in midsole construction include polyurethane, rubber & EVA (the least durable & generally not used in safety footwear). A: Non Woven Board, Leather, Leather Board, Canvas & Kevlar Fabric is generally used as insole. Non-Woven board & Kevlar are used in Antistatic footwear. A: The shank is a metal or heavy composite plastic strip in the midsole for reinforcement of the wearer's arch, providing support to the bottom of the boot. The shank is glued, whipstitched or tacked in place. Now a day it is not used in majority of the footwear. A. Sole tread design & material compounding ability to grips the microscopic roughness of the floor provide slip resistance. The open channel that disperse liquids out from under the shoe sole provide maximum slip-resistance. A. Different sole compounds & tread designs create different coefficients of friction. Therefore, some grip the floor better than others. A. No. Only those have been tested for slip-resistant. (SRA & SRC). Even these tests do not mean you won't slip. Please remember that NO sole is 100% slip-proof.These tests provide extra protection but no guarantee that you wont slip. A. No. Generally that refers to the sole’s ability to resist fuel oil. However, our shoes are oil resistant as well as slip resistant on both wet & greasy or oily surfaces. A. There's no one answer to the question. It depends on how you use your shoes. We have heard from numerous people stating that our shoes have lasted anywhere from 12 months to 3 years! And, we guarantee our sole for 6 months against any manufacturing defect. A. Safetix operates Quality Management Systems which conform to ISO 9001: 2008. A. Safetix footwear meets the specifications as provided in European EN 345 & Indian IS 15298. Test reports are available on request. A) Products meet highest international standard. B) Elimination of workers down time as a result of complaints & strikes related to Shoe quality. C) Products are competitive priced & will ensure cost saving whilstmaintaining quality. D) Safetix offer full range to combat electrical hazard (ESD, Antistatic & Electrical Insulative). A: The answer is definitely yes. Any protective toe styles we manufacture regardless of the protective toe cap material must meet the same EN 20345 & IS 15298 Impact & Compression test requirements. It does not matter whether the toe cap material is steel, composite, & or any other material. Until approximately 10 years ago the only option for protective toe footwear was with steel toe caps. Steel toe footwear has served the industry well over this time & continues to do so today. However, one key addition in the past one decade has been footwear with non-metallic composite toe caps. Some people are fans of composite toe caps, while others can be fans of footwear made with steel toe caps. We are proponents of both. Footwear made with either of these toe caps are tested to the same EN/IS Standard Impact & Compression requirements. The main reason for composite toes is areas where footwear is needed to pass through metal detectors such as in prisons or in the Airports. Composite toe caps used in footwear with other non-metallic components is ideal for this use. Many people believe that composite toes work better for cold weather & high heat conditions since steel reacts differently to these temperature extremes. composite toe cap provide better cold insulative properties. Composite toe cap have better impact resistance as they have a memory, meaning that they try to spring back to original shape after impact. This property is missing in metal toe cap & therefore safety experts recommend to change metal toe cap safety boot once it has a meaningful impact on the toe cap. A: 3 fantastic style that fits the above criteria are Safetix President, Tycoon & Evo Pro. Please check out some other styles that are slightly more casual but still may fit your needs. A: Take a look at our Cosafe (Meta). A: We have 4 Articles under this category: You can choose from, Duncan High, Duncan Low, Vertix & Trainix. Duncan series have the additional features of a non-metallic composite toe cap. Q. What is S1-S5 classification for Safety Footwear ? The most well known & widely followed standard for safety footwear is the one created by the International Organization for Standardization known as ISO EN 20345:2004. This starts with a basic definition of safety shoes, then categorizes other shoes to indicate additional safety measures. Basic safety boots are defined by this standard as having protection for the toes & an anti-slip sole. With this, the toes are protected from hazards such as nails or other sharp objects puncturing the shoe & from being crushed by heavy objects rolling over or landing on them. The anti-slip sole helps prevent accidents caused by slippery conditions such as small oil patches on the floor in a mechanic's garage. The standard then divides shoes into two classes: non-polymers, such as leather, & polymers, such as rubber. They are then designated by the level of additional protection between S1 & S5. Levels S1 - S3 cover non-polymer shoes; S4 & S5 cover those made of polymers. Levels S1 & S4 add a protected & energy absorbing heel & some antistatic properties to the basic safety boot. Heel protection further protects the foot from punctures & crushing forces, and would be needed in factories or on construction sites. The energy absorption provides comfort & helps to protect the wearer from injury caused by the foot impacting on a hard surface like a factory floor. The antistatic properties are generally for environments where a spark could be dangerous, where employees work around explosive gasses or other materials. S2 covers water resistance or water proofing which is important for anyone working in wet environments. This requirement is part of the basic standard for polymer shoes, so this applies only to non-polymer shoes. Levels S3 & S5 have all properties of S1, S2 & S4. They add the protection of metal insoles & studded soles. The metal insoles provide additional puncture protection for the bottom of the foot, which can be very important at some construction sites & demolition sites. The studded soles provide slip-resistance in extreme conditions, such as ice, which could be encountered by workers such as firefighters working in subfreezing temperatures. There are other safety features defined in this standard as well, such as heat, cold, & electrical resistance. However, understanding the basic protections as outlined above should be sufficient for a company to understand the level of protection employees will need. Q: Is Safety Footwear mandatory in a Workplace, Factory, Construction site, Port etc ? The provision & maintenance of plant & systems of work in the factory that are safe and without risks to health. The arrangement in the factory for ensuring safety & absence of risks to the health in connection with the use, handling, storage & transport of articles & substances. The provision of such information, instruction, training & supervision as are necessary to ensure the health & safety of all workers at work. The maintenance of all places of work in the factory in a condition that is safe & without risks to health & theprovision and maintenance of such means of access to, and egress from, suchplace as are safe and without such risks. The provision, maintenance or monitoring of such working environment in the factory for the workers that is safe, without risks to health & adequate as regard facilities & arrangements for their welfare at work. Electrical Hazard or Electro Static Dissipating...Which do I need? Q: What is the difference between Electro Static Dissipating (ESD) footwear and Electrical Hazard (EH) protecting footwear. 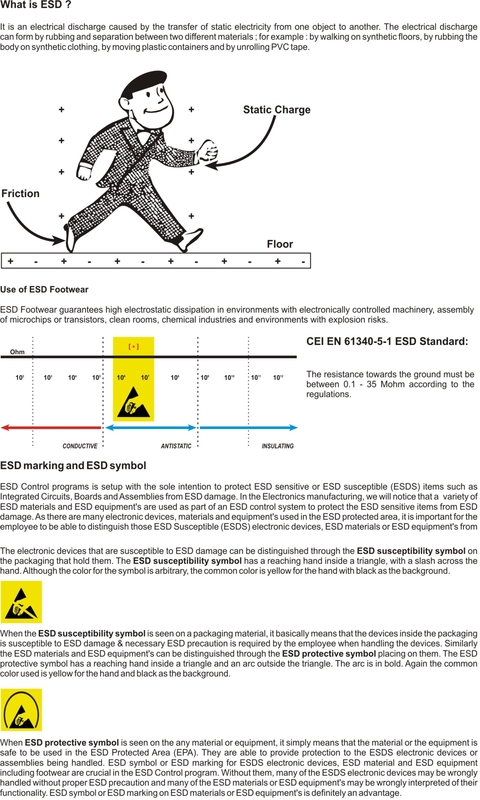 A: The difference between ESD footwear and EH can be confusing! Both deal with what seems to be similar things, when in fact they are quite different. Let's go over the differences. We'll start with ESD. The human body behaves as a walking isolated conductor of electricity. When you walk, you body generates a static charge. (Think about those times as a kid when you would rub your socks on the carpet to try to shock your friend.) So when you work in a technical environment, such as a factory where you are making electric chips, you don't want to give off the static electricity generated by your own body because it could zap or burn the chips, making them useless. Wearing SAFETIX ESD footwear will minimize the charge that your body creates as static charges are not allowed to build up. EH boots, on the other hand, are designed to significantly reduce the flow of electricity through your body. EH boots like BLAZE & SMELT are ideal for when you are working with live electrical circuits or wires. EH boots will help to stop the electricity from the wires from electrocuting you as they don't allow electric circuit to complete. They slow the electricity down as it comes to and goes through your body. SAFETIX Electrical Hazard footwear is Tested up to 14,000 volts in dry conditions. Hopefully these descriptions provide a little bit more understanding and can help you in finding the best pair of shoes or boots for your job! Thanks to Carry for taking the time to explain the difference to us! Copyright © 2012 by RahmanGroup. All rights reserved.